Explanation: The dark, inner shadow of planet Earth is called the umbra. Shaped like a cone extending into space, the umbra has a circular cross section that can be most easily seen during a lunar eclipse. For example, last Saturday the Full Moon slid across the northern edge of the umbra. Entertaining moon watchers throughout Earth's eastern hemisphere, the lunar passage created a deep but partial lunar eclipse. This composite image uses successive pictures recorded during the eclipse from Athens, Greece to trace out a large part of the umbra's curved edge. 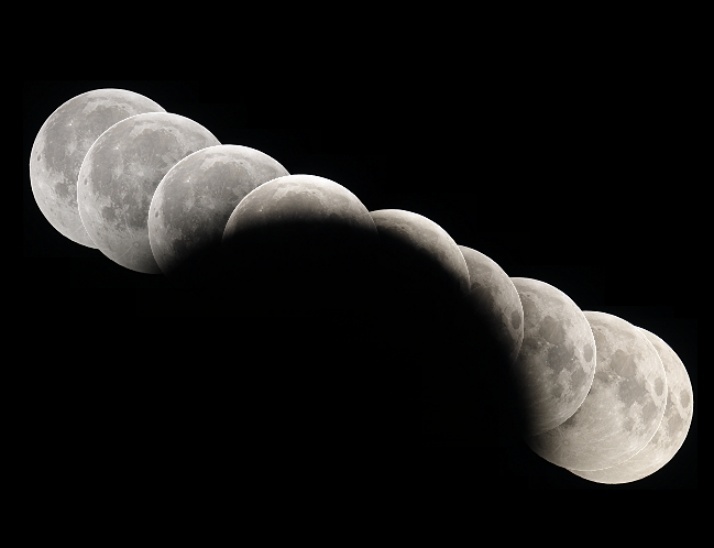 The result nicely illustrates the relative size of the umbra's cross section at the distance of the Moon, as well as the Moon's path through the Earth's shadow. Or the the photographer got his thumb in the shot, either or. Where did they get all those moons? Awe inspiring photo. I wish I was still teaching astronomy - my classes would have loved it. According to the explanation, its' a composite photo made up of successive photos taken around Athens, Greece during a recent lunar eclipse. GeoffNelder's right; though....it is an awe-inspiring photo. My first thought when I read the title of this topic: HOW can Earth have a shadow in the space? Smart. Anyway, that photo is really handsome.